How to fix a flower bed full of weeds in your garden? You can spend the first few weeks of tearing up weeds, however the chore soon wears thin. Don’t get too worked up about. A few simple strategies and your garden will be weed free. Armed with a better understanding of weeds and the methods listed here, you can give yourself more time to enjoy your garden. Weed seeds are everywhere, but in the top inch or two of soil get enough water or light to trigger germination. Digging and cultivating brings hidden weed seeds to the surface. Dig only when you need to and immediately salve the disturbed spot with plants or mulch. 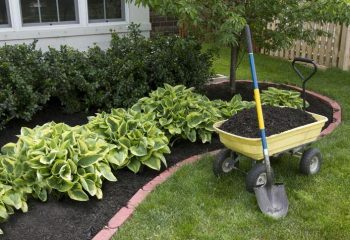 Mulch benefits plants by keeping the soil cool and moist and depriving weeds of light. Organic mulches, in particular, can actually host crickets and carbide beetles, which seek out and devour thousands of weed seeds. It’s important to replenish the mulch as needed to keep it about 2 inches deep. More than 3 inches deep can deprive soil of oxygen. 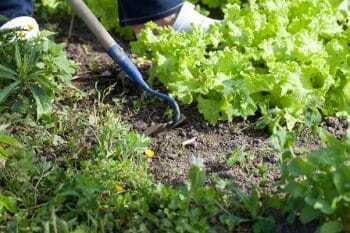 In any case, you can set weeds way back by covering the soil’s surface with a light-blocking sheet of cardboard, newspaper, or biodegradable fabric and then spreading prettier mulch over it. If you choose to use this method on seldom-dug areas, such as the root zones of shrubs and trees, opt for tough landscape fabric for the light-blocking bottom sheet. As soon as enough organic matter accumulates on the landscape fabric, weed seeds dropped by birds or carried in on the wind will start to grow. For the bottom layer of fabric to be effective, these must be pulled before they sink their roots through and into the ground. Pull when wet and hoe when dry is good advice when facing down weeds. 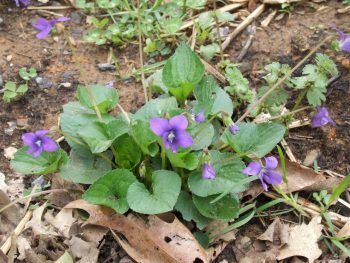 After a heavy rain, start weeding session by equipping yourself with gloves, a sitting pad, and a trug or tarp for collecting the pulled weeds. When going after bigger weeds, use a fishtail weeder to pry up tap rooted weeds, and dandelion or dock. Under dry conditions, weeds sliced off just below the soil line promptly shrivel up and die. In mulched beds, use an old steak knife to sever weeds from their roots, then patch any open spaces left in the mulch. You will need pruning loppers to take down towers of ragweed or poke, or you can step up to a string trimmer equipped with a blade attachment to cut prickly thistles or brambles down to nubs. When you can’t remove weeds, the next best thing is to chop off their heads. With annual weeds, dead­heading allows a couple weeks from returning. Cutting back the tops of perennial weeds, like bindweed, reduces reseeding and forces them to use up food reserves and exhaust their supply of root buds, thus limiting their spread. Closing plant spacing chokes out weeds by shading the soil between plants. You can prevent weed friendly gaps from the get-go by designing with mass plantings or in drifts of closely spaced plants rather than with polka dots of widely scattered ones. You can usually shave off about 25 percent from the recommended spacing. No matter which method you choose, chopping down weeds before they go to seed will help keep them from spreading. Garden Sizes vary from small yards to large landscapes. Call Ryno Lawn Care for a professionals touch with your landscape. I like what you mention about making sure to pull weeds when they’re wet. It makes sense that this can be a good way to get rid of the weeds and roots. This is something to remember because while some weeds in the yard are too big to pull and require professional attention, this could be helpful for the smaller ones.